“Can you believe that we are nearing the end of another year? 2018 has been another exciting and momentous year for the Lincs & Notts Air Ambulance, and I am extremely proud of all we have achieved over the past 12 months. 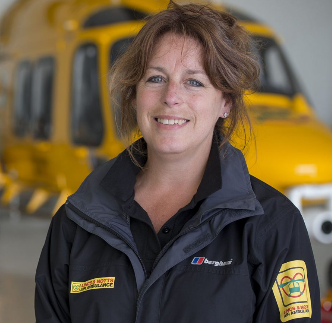 “This year, we are thrilled to have started to phase in our 24-hour operations, with our helicopter currently on call to fly 24 hours over the weekends, which are typically the days when our critical care team are needed the most. Our 24-hour weekend operation will continue to operate throughout 2019 as we work towards building up to providing our 24-hour service 7 days a week, enabling us to give more people than ever before the very best chance of survival. “So far this year, our crew have attended over 800 missions to tend to patients in their greatest hour of need. 26% of the missions we have attended have been to children and young adults under the age of 30, with our youngest patient being less than a week old. “On average, we are dispatched to 3 missions every single day, where we provide the equivalent of a hospital A&E department directly to the scene of the most serious and time critical 999 calls in Lincolnshire and Nottinghamshire, including road traffic collisions, cardiac arrests, sporting injuries, agricultural incidents and serious falls. “I am delighted to have met a number of our remarkable former patients and their families throughout the year. It has been truly inspiring to hear of their courage, determination and bravery whilst overcoming some of the most devastating and traumatic injuries. I was especially touched to hear from former patient Paul, who suffered a cardiac arrest at the height of this years’ ‘Beast from the East’ chaos. With all roads covered in thick snow and whole communities cut off, our pilots braved the snow-laden skies to fly Paul to Lincoln County Hospital, just in time for surgeons to perform a life-saving operation. “With thanks to the incredible work of our paramedics, doctors, and pilots, it’s incredibly heart-warming to see families still together, and moments like this remind me why our Charity is so important. As we receive no direct Government funding, we must continue to raise these vital funds to make sure that we are there for the next patient that needs our help. “We are extremely grateful to everyone who has supported us this year, especially our army of volunteers, who tirelessly give their time in a variety of ways. Then there are the hundreds of people, clubs, groups and businesses who have raised funds for us, with one of our supporters, a local farmer, dressed as a scale model tractor in the heat of this year’s London Marathon in order to attract attention and raise funds. Thank you to each and every one of our supporters; every penny really does help us to continue saving lives 365 days of the year and enables us to be the very best at what we do. “I would also like to take this opportunity to say a huge thank you to our amazing crew and Charity staff for the tremendous job they do. They all work tirelessly to provide a truly outstanding service, whilst touching the lives of so many every single day. “As we head into 2019, we are preparing for another busy year as the Charity celebrates its 25th anniversary. It will certainly be a big year of celebrations for us, and we look forward to announcing some of the exciting activities we have planned in the New Year. “Finally, whilst most of us will be celebrating over the Christmas holidays surrounded by our loved ones, please do take the time to spare a thought for our pilots, paramedics and doctors who will be on-duty as usual over the festive period, including Christmas Day. Should we be needed, our crew is on standby seven days a week, 365 days of the year, no matter what.